Where do I use my eHarmony voucher code? Find a Discount you would like to use at eHarmony from our selection at NetvoucherCodes. Follow the link through to the eHarmony homepage and select ‘Get Started’. Fill in your details and the questionnaire. Choose a Subscription plan of your choice and enter your code in the box provided below. Discount will be deducted once the process is completed. Clinical Psychologist Dr Neil Clark Warren has 35 years of experience in applying scientific methods to understanding what makes relationships work. Questioning whether there was a better way to find a compatible partner, he launched eHarmony in 1997. After years of studying couples, eHarmony’s Los Angeles team picked on certain characteristics they thought were key in forming satisfying relationships and placed the matching of these at the core of their business. In 2007, eHarmony partnered with the Oxford Internet Institute at the University of Oxford to develop an algorithm specifically for the dating website, making it even more effective. 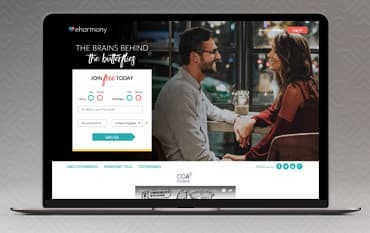 With 4 million members, a 1:1 male to female dating ratio, and over 400,000 relationships formed (and counting) eHarmony.co.uk has become the country’s go-to site for finding love. Its free mobile dating app means you can take matchmaking with you wherever you go and if you’re looking for something specific, it even has platforms for Christians, single parents, Asians and more. What’s more, if you are in need of advice, eHarmony has comprehensive dating guides to everything from first dates to moving in together. eHarmony’s complex algorithm matches you with people who share more than just a few common interests, but who share your approach to life. It uses 29 key compatibility points to make sure you’re matched with people who share your values, making meaningful matches easier and fruitful relationships possible. Developed by Dr Neil Clark Warren and adapted by the Oxford Internet Institute, the software is sophisticated but easy to use – you’ll be seeing matches in no time. eHarmony has brought together millions of singles who have gone on to have happy relationships. Head to their website and read tons of lovely, funny stories about how these relationships have worked out. There’s an array of story categories to choose from including ‘international couples, ‘eHarmony babies’, ‘long distance relationships’, ‘singles with children’, ‘eHarmony cynics’ and much more. So no matter what your situation may be, you are sure to find a love story that you can relate and find encouragement in. No matter who you are, eHarmony has the person for you, just take a look at the many success stories from real-life people and begin your membership today. If you have a success story of your own, eHarmony would love to hear it! Share it with them on their website and inspire other singletons to give online dating a chance. Look for a partner based on more than just looks and interests. Specify the lifestyle, location and even the accent of your potential match with the very individual dating options available at eHarmony. Choose your preferred ethnicity whether that be Asian, Indian, Muslim, European or Chinese, choose your preferred age including the over 50s and 60s, and even specify the type of job you want your match to have. Discover matches in your area with eHarmony’s local dating option. Choose which part of the UK they’re from whether that be Yorkshire, the East Midlands, Scotland or Greater London, or if you want someone from further afield, choose international dating to find a partner from Australia, Canada or the USA. Why am I getting matches outside of my match preferences? If you have received a match that is outside your current match settings, this is most likely a flex match. Find out how to change this setting. Call: 0800 028 0308 should you need any assistance. eHarmony’s customer service team is available by phone from 10.30 am to 7.30 pm, Monday-Friday, and 9.00 am to 6.00 pm on Saturdays. You can also use the live chat feature. Email: You may also reach eHarmony by selecting the "Email: Click Here" option located at the bottom of any of their articles. One of their customer care representatives will be more than happy to assist you within 24 hours. Find out more, with the eHarmony tour. Learn new tips and tricks with the great date guide. Get some help on your love life with eHarmony’s dating advice. For an updated dating experience without the stiff conversation and awkward small talk, choose eHarmony. No longer do you have to suffer your friends’ matchmaking and blind dates, with eHarmony’s complex algorithm you can be matched with highly compatible singletons looking for the same thing as you, all in the comfort of your own home. An eHarmony promo code can save you money on your membership too, allowing you to start meeting people for less. With over 4 million members and 400,000 relationships formed, isn’t it time you made a profile? We are constantly on the hunt for first order Voucher Codes for eHarmony to help you with your money saving. Our experts check dozens of sites for secret codes including NHS discounts, student sites & social media channels saving you time & money!